Blue Rider Press, 9780399573651, 304pp. 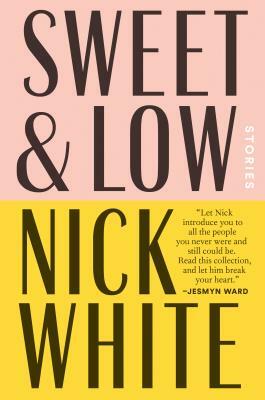 At first glance, the stories in Sweet and Low seem grounded in the everyday: they paint pictures of idyllic Southern landscapes, characters fulfilling their roles as students, wives, boyfriends, sons. But they are not what they seem. In these stories, Nick White deconstructs the core qualities of Southern fiction, exposing deeply flawed and fascinating characters--promiscuous academics, aging podcasters, woodpecker assassins, and lawnmower enthusiasts, among others--all on wildly compelling quests. From finding an elusive bear to locating a prized timepiece to making love on the grave of an iconic writer, each story is a thrilling adventure with unexpected turns. White's honest and provocative prose will jolt readers awake with its urgency. “White’s incisive exploration of the South…is beautifully tempered with sincerity and irony." "Sweet and Low is a masterpiece collection, and White is a virtuoso of voice. The poignant, dry wit of these stories--imagine if Faulkner wrote an episode of "The Golden Girls"--will have you falling in love and cackling. But it's the reckoning honesty within each tale that will truly melt your spine. Prepare for all your feelings to be snatched and then returned to you, purer and wiser. This is a book you can't help but clutch to your chest." "Mississippian Nick White gathers in his stories the stereotypical places and faces and aspects of the South-juke joints, whiskey-logged writers, Gatlinburg tourists, a summertime heat 'so thick it has texture and personality'-and tosses out the sap in favor of unvarnished characters set against a brooding, beautiful region." "Nick White captures the essence of the struggles of humanity. Death, resentment, and anger are set loose throughout these stories, but White gives readers a chance to spend time with his characters in a way that evokes empathy instead of despair." "An author on the rise, White displays impressive range in this rewarding collection." "[A] fine exemplar of lower-class yearning,... Work that bears the promise of good things to come."